It’s December and that means one thing—a great excuse to buy books on birding. I thought I’d do a round-up of some of the best bird books reviewed this year, a few memorable titles from recent years past, and one that wasn’t reviewed but which I love, that would be great holiday gifts. 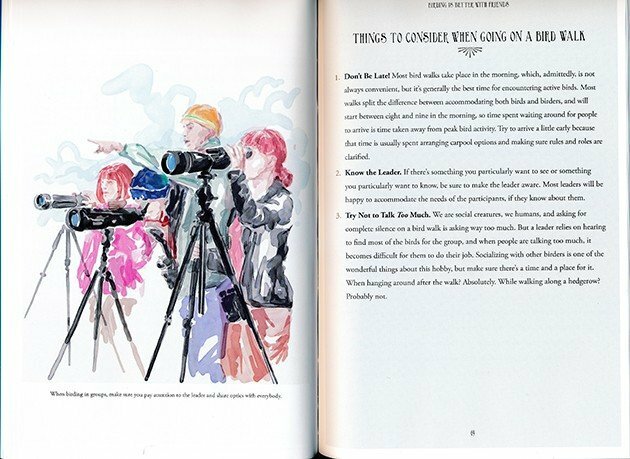 Birding for the Curious, by Nate Swick, is the perfect gift for the person who has asked questions about your binoculars or early morning birding trips and who needs just a little push to become an active naturalist. Nate introduces the tools, skills, and knowledge base of birding with friendly encouragement, combining text with activities that range from field sketching to using eBird. 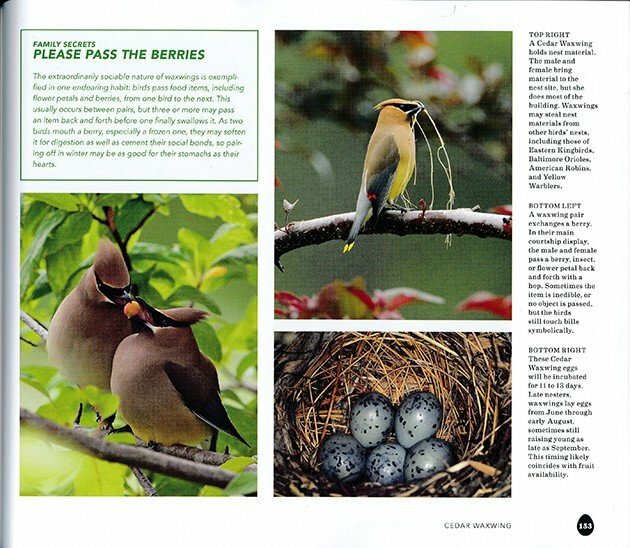 The most common thing I was asked for when I volunteered at the Sandy Hook, N.J Bird Observatory (now gone) was “a book that shows all the birds in my neighborhood.” I wish the American Birding Association’s Birders’ Guides had been around then. 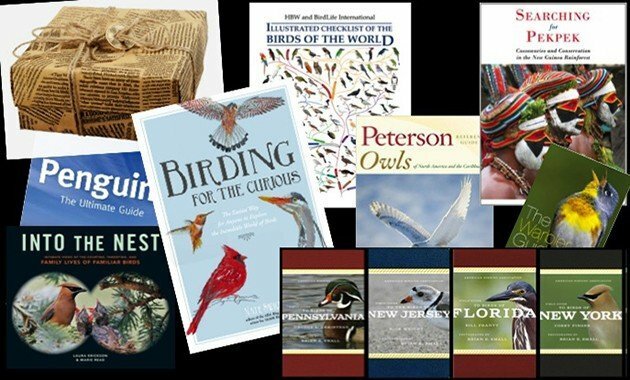 Written by state experts, each book covers 250-320 species of the most common and notable birds of the state (thank you Rick Wright for the correction! ), offering compressed but specific information on identification, habitat, areas of the state where the bird is most likely to be found, and photographs by Brian E. Small and other photographers. I’ve written reviews of titles in the series, but proof of how good they are came when I gave the ABA Field Guide to Birds of Florida to my 12-year old nephew as a birthday gift. Jake lives in southeast Florida and loves fishing and Blue Jays (the bird, not the team). A couple of weeks later, my sister texted me, “Found the bird book in Jake’s lunch box. He takes it to camp every day.” Bird book gift–$24.95; effect on a boy’s life–hopefully priceless. The ABA series currently lists guides on New Jersey (Rick Wright), Florida (Bill Pranty), Arizona (Rick Wright), Colorado (Ted Floyd), and California (Alvaro Jamarillo). If the beginning birders in your life live in other states, you can always give them IOUs for guides to be published in 2016. These include Pennsylvania (George Armistead) and, the one we 10,000 Birds beat writers are really looking forward to, The ABA Field Guide to Birds of New York, by Corey Finger. There are times when I get tired of reading bird guides and want to sink my teeth into a good book. Those are getting harder to find, so I was very happy when I was asked to review Searching for Pekpek: Cassowaries and Conservation in the New Guinea Rainforest, by Andrew L. Mack (Cassowary Conservation and Publishing, 2014) for Birding. Mack tells the story of how he set up a research station, and a life, in Papua New Guinea. He also thoughtfully and harshly critiques Big Conservations’ strategies in developing countries. This is a great read, filled with humor and adventure. 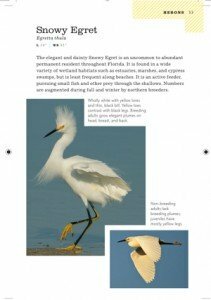 Published, by Mack’s nonprofit organization, it also serves as an example of successful alternative publishing in the birding world. Another great birding adventure book is The Jewel Hunter by Chris Gooddie (Princeton Univ. Press, 2012). Brit birder Goodie didn’t do an ordinary big year; he decided he would see every Pitta species in the world (32 at the time) in one year. And, he did, trekking to remote areas of Asia, Africa, and Australia, often on his own, always on the lookout for a good beer. I think of The Jewel Hunter often when I travel to foreign countries, wishing I could do it like Goodie did. It’s a book that is still drawing comments for its passion and humor. Two books came out this year that combine stunning photographs, the kind you want to frame, with comprehensive research on birds. 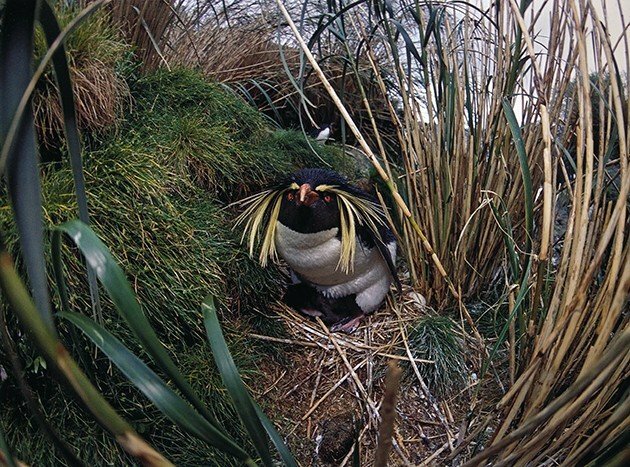 Into the Nest: Intimate Views of the Courting, Parenting, and Family Lives of Familiar Birds (Storey Publishing, 2015) by photographer Marie Read and writer Laura Erickson, documents the procreative and parenting lives of 49 species through beautiful images and readable, knowledgeable text. This is a book that could also be put in the “for the beginner” category, since one way to get people interested in birding (and conservation) is through nests and baby birds. The high level of expertise of the text also makes this an excellent reference source. Everyone also loves penguins, which makes Penguins: The Ultimate Guide (Princeton Univ. Press, 2014) by Tui De roy, Mark Jones and Julie Cornthwaite, a gift you can give anyone. Hopefully, someone who won’t mind when you sneakily use the book to find out where Northern Rockhopper Penguins (below) nest, how to distinguish Magellanics from Humboldts, or how these flightless, awesome birds evolved. I probably should have started off with this category, because you might want to print this article out, circle the titles you want, and put it up on the refrigerator. Or, do what I do, and give yourself some cool bird books as holiday gifts. You bird hard all year and you deserve them. This is also a good time to catch up on supplementary titles, such as guides to bird families. Scott Weidensaul’s Peterson Reference Guide to Owls of North America and the Caribbean (HMH, 2015) is a comprehensive treatment of the 39 species of North American owls based entirely on ornithological research, and well-written and beautifully illustrated to boot. Gerard Gorman’s Woodpeckers of the World: A Photographic Guide (Firefly Books, 2014) describes the 239 species of the family Picidae in all their hooded and crested, spotted and streaked glory. Tom Stephenson and Scott Whittle’s The Warbler Guide (Princeton Univ. Press, 2013) has almost reached bible status amongst North American birders (especially those who bird the central and eastern areas). 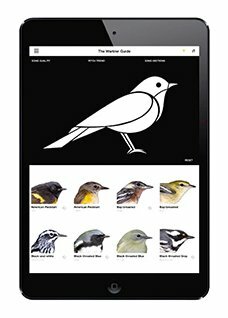 The Warbler Guide App, a re-thinking of the book that takes advantage of app features such as filtering and three-dimensional images, is a fun alternative gift for birder friends who are never more than an inch away from their smart phone or iPad. And, if you love beautifully made and illustrated bird books, you might consider asking a generous family member (or yourself) for the Illustrated Checklist of the Birds of the World, Volume 1: Non-passerines (Lynx Edicions in association with Birdlife International; 2014, $265). 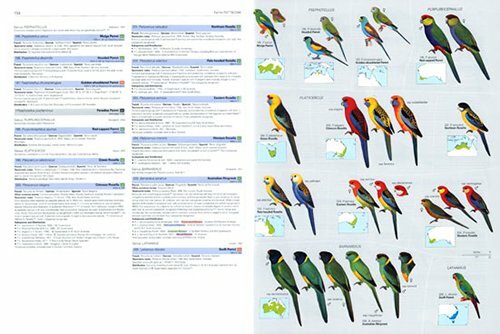 Called by some “Handbook of the Birds of the World Lite,” the 904-page volume offers 357 plates, 8,290 bird illustrations, 4,428 distribution maps, 34 full-page reference maps, and 2,126 bibliographical references. It’s a much more than a checklist! I could (and have) spend hours mooning over the plates. The range of biodiversity in the avian world is wonderful but a little scary. Lynx is offering a good deal if you order both this volume and the forthcoming Volume II, Passerines before the latter’s publication date. Remember, this is the holiday season. Catalogs and shop windows are filled with potential gifts that cost much more, and which don’t have the advantage of an up-to-date taxonomic organization. So, Happy Holidays to all! Let me know what birding books (or apps) you are buying for friends and families, and what books are on your wish list. Reading–it’s the next best thing to do when the blizzard starts to rage (the first being storm birding, of course). Each of the ABA guides actually covers 250-320 species, not just 100. Thanks for the mention — love the story about your nephew. Oops, corrected, thanks Rick. The flexibility of blogs. And, I still have high hopes that Jake will gravitate to birds at some point in his life. I’m a patient aunt.